A chronology of bomb attacks and explosions in Lebanon since October 2004. December 12: Prominent anti-Syrian MP and journalist Gibran Tueni and three others are killed in a car bomb attack as they travel through the Mekallis area of eastern Beirut. September 25: May Chidiac, a well-known television news journalist for the Lebanese Broadcasting Corporation, is seriously wounded by a car bomb in Jounieh, north of Beirut. September 17: A powerful blast rocks the Ashrafiyeh district of Beirut, killing one person and injuring at least 22 more. August 22: At least two people are injured when an explosion takes place outside a hotel and shopping centre in the Zalka suburb of Beirut. July 22: Several people are injured in a car bomb blast in a busy Beirut street. July 12: Former Defence Minister Elias Murr - a staunch supporter of Syria - is injured and two others are killed in a bomb attack as his motorcade passes through the affluent Beirut suburb of Antelias. June 21: Ex-Lebanese Communist Party leader George Hawi and critic of Syria is killed when his car blows up as he travels through the Wata Musaitbi district of Beirut. June 2: Anti-Syrian journalist Samir Qasir is killed in a car bomb outside his home in Ashrafiyeh. May 7: At least one person is killed and seven are injured in an explosion in Jounieh, east of Beirut. 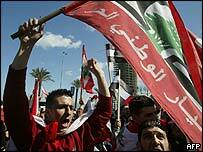 March 27: A bomb explodes in a mainly Christian area of Beirut, wounding at least six people. March 23: Three people are killed when a bomb explodes in a shopping centre in Kaslik, near Jounieh. March 19: A car bomb has wounds at least 11 people in a predominantly Christian suburb of Beirut, New Jdeideh. February 14 2005: Former Lebanese Prime Minister Rafik Hariri - a critic of Syria - is killed by a massive truck bomb blast in Beirut. 20 others were killed by the explosion - including former minister Bassel Fleihan. 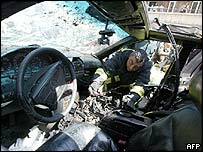 October 1 2004: Marwan Hamadeh, a former Lebanese minister is injured and his driver killed in a blast near his home on Beirut's seafront.